From Fashioncraft - an exclusive and magnificent Fairytale design / Cinderella themed combination set with all you need to cut your grand occasion cake, offer a toast and create a guest book full of hand written heartfelt messages! Cake server and cake knife each have Stainless Steel blades that are serrated for easy cutting. The handles are made from sturdy poly resin painted in a white pearlized finish. Molded into the handles is a beautiful castle design. The guest book is a bound white book with a luxurious leatherette finish. The cover is a sturdy piece of poly resin painted in a white pearlized finish. On the cover is an intricately molded design of a pumpkin coach being pulled by a beautiful white horse up a steep mountain road to a majestic castle. The pumpkin coach has a heart shape cut out for the placement of a picture of the Bride and Groom. The book contains 50 lined pages each with the word 'Guests' as a header. 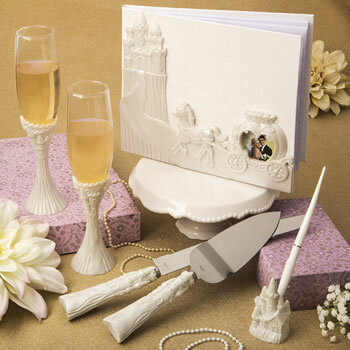 The pen set is crafted from durable poly resin with a beautiful white pearlized finish. The base features an intricately molded design of a majestic castle sitting on a mountain top. Included is a formal style white pen inserted into a white holder with a metal swivel that is attached to the castle base. The flute set (2475) the Size of each flute glass 9 3/8" tall x 2 1/8" x 2 1/8"
Thecake knife set(2476)the Size of cake server is 10 1/2" x 2" x 7/8"
Size of cake knife is 12 1/2" x 1" x 7/8"
Size of picture in the coach 2 1/2" x 2 1/8"
The pen set (2478) the Size of pen set 8" x 1 5/8" x 1 3/4"